By 1658 there was an acute shortage of labourers at the Cape. Jan van Riebeeck tried to alleviate the position through the importation of slaves. 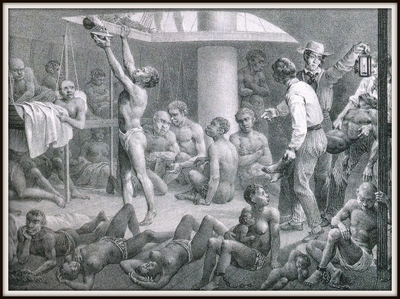 Two small vessels, the Maria and the Hasselt, were sent to the West Coast of Africa to imprison slaves, but before the Hasselt returned with one hundred and eighty five slaves secured from the Slave Coast, the Indiaman Amersfort anchored in Table Bay. She had one hundred and seventy slaves on board. They were the survivors of two hundred and fifty slaves who had been taken as a prize from a Portuguese ship. These, together with those landed from the Hasselt, were considered to be more than sufficient for local needs. All their names were written down, and those who did not have any, were given a name. They were also given decent clothes to protect themselves against the increasing cold weather. The strongest were put to work. In his journal of: Wednesday, 28th August 1658, van Riebeeck reported that “It became more evident that the Guinea and Angola slaves, were inclined to desert, especially now that 14 slaves have run away last night, even from free sawyers, who treat their slaves better than any other freemen do theirs. It was decided that, as a matter of urgency, the blacksmith should make an efficient amount of chains to shackle all the Company’s slaves, except the old and sickly men, females and children. The Free Burghers were encouraged to put in an application for these shackles. The Eastern slaves, often Moslem and highly skilled in crafts, were too useful to be employed in agriculture. Burghers in the Town purchased them, usually at a high price; many were skilled craftsmen before they reached the Cape. Others, were taught such crafts as tailoring, bricklaying and baking by burghers and soldiers. Soon, however, this lodge also became too small and in any case had fallen into such a state of disrepair that it was decided to build a large new lodge next to it in the form of a single-storied rectangle, round an open court on the land recently cut off from the Company’s Garden. It was to house some 500 to 600 slaves and was intended at the same time to supplement the defences of the Castle. As might be expected, this lodge, which is nearly as old as the Castle, has undergone important structural and functional changes during almost three centuries of existence. Although it was frequently allowed to fall into disrepair and was often threatened with demolition. The building housed the Company’s slaves for nearly 131 years. After much delay, it was at last restored and enlarged in 1732, and the possibility of adding a second storey was investigated. In 1752 it was once again renovated and enlarged. The northern wall (Bureau Street) was shifted up to the boundary wall of the churchyard, while the eastern wall was moved up to the moat of the Company’s hospital in the Heerengracht. In 1807, on the recommendation of the Earl of Caledon, most of the slaves housed in the lodge were sold. It was then decided to convert the building into government offices. This gave rise to important structural alterations, which were carried out in 1810. 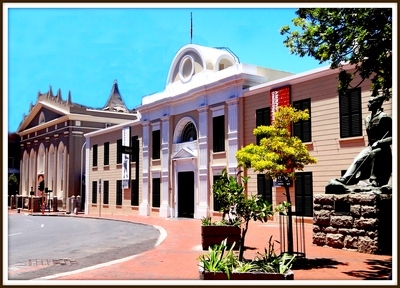 In 1926 the Adderley Street facade was set back 13,4 m. The work was done most meticulously and it is claimed that the present facade is not only identical with, but just as good as Thibault’s work. In 1967 the Slave Lodge became opened its doors as the SA Cultural History Museum.